Larry in Wonderland is a Pearls Before Swine Collection featuring the daily newspaper strips which ran from August 23, 2009, to May 23, 2010. If you have never heard of it before, Pearls Before Swine is a comic strip that features anthropomorphic rats, pigs, zebras, crocodiles and whatnot. It runs the gamut from your pretty typical comic strip type humor (you know, things like Twitter jokes or a cactus who wants a hug) to some pretty seriously self-referential meta-weirdness. As I live in a small town where the local newspaper is apparently written by meth-addled sixth graders and is nearly unreadable, I haven't had access to daily comic strips in some time. 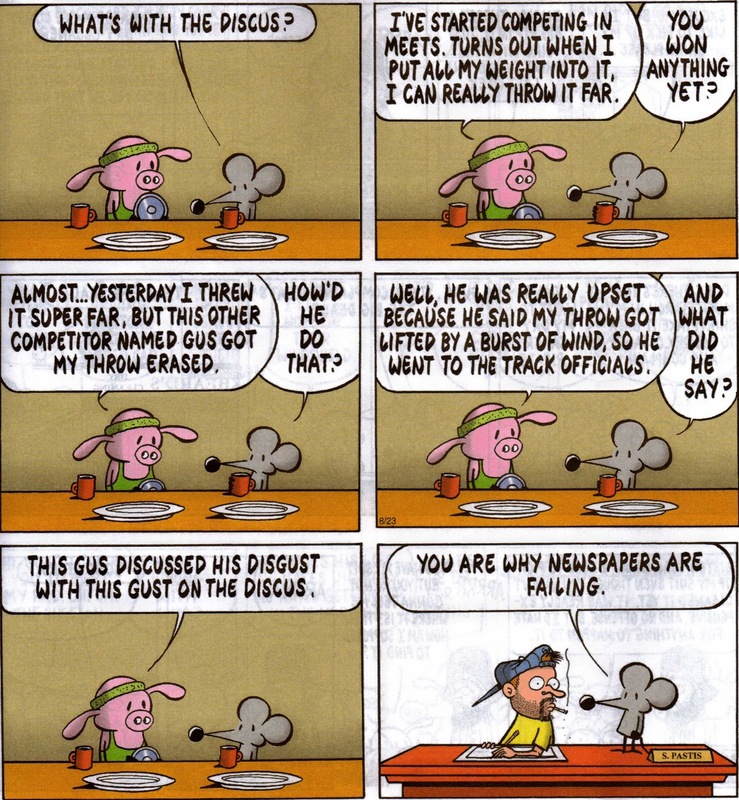 Because of this, I had no idea what to expect from a Pearls Before Swine collection. And I sure as hell couldn't have imagined something like this. This strip has moments of such weirdness that I cannot fathom how it is as popular as it is in mainstream culture. I don't think Stephan Pastis can figure it out either. Maybe this is why he begins the collection with a number of letters to various newspaper editors across the country all expressing their outrage at Pearls Before Swine. Or maybe this is just part of the joke? A normal strip would have ended one panel sooner, which would have made fans of Family Circus chuckle and would have probably been posted on Facebook by Middle School English Teachers and Librarians. But Pastis adds that last panel, which causes the humor of the strip to shift dramatically to the weird, and this allows it to stride into the realm of meta-fiction wearing clown shoes and a fake rubber nose. 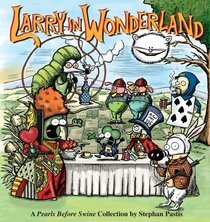 The fact that Larry in Wonderland debuted at number one on the New York Times Best Seller list in the Paperback Graphic Books category says more about the shift in our nation's sensibilities than any other news item I can possibly think of. We have finally become a nation of freaks who revel in the bizarre. This is the culture of the Letterman generation, and Pearls Before Swine is its Peanuts. I'm not even sure if I am recommending this collection as a sociological examination of American culture or as a funny book, but either way, if you got some free time and are looking to indulge in a few giggles, than you could do worse than picking up Larry in Wonderland. If you end up writing your doctoral thesis about it, please send me a copy.